After crossing the Beagle Channel from Ushuaia to Puerto Williams and completing the Chilean immigration formalities for ship and passengers we headed west towards the Alberto de Agostini National Park and the Cordillera Darwin mountain range with its numerous mountain peaks, glaciers running into the sea through dense evergreen rainforests and natural harbours or caletas in Spanish. The caletas are crucial for such a journey with a sailboat because they provide the natural hideouts and save anchor places for the ship at night or during bad weather and storms which are encountered frequently in this part of the world. At the same time the caletas allow comparatively easy access to the land to explore the landscape and the diverse and abundant flora and fauna of the Magellanic subpolar forests. Once the almost impenetrable vegetation and treeline has been crossed crawling up from the shoreline, climbing the hills behind provides breathtaking views of the surrounding landscape. After about a week we turned north to enter the Strait of Magellan and the Smyth and Sarmiento channels which brought us to the Bernardo O’Higgins and Torres del Paine National Parks and allowed us for the first time to actually see the Southern Patagonian Ice Field from the seaside. 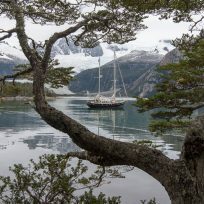 After another week sailing north we reached after a long stretch of continuous day and night sailing the first settlement since our departure: Villa Puerto Edén. The village with about 300 inhabitants is known for being one of Chile’s most isolated inhabited places and the home of the last Kaweskar people. The village has no roads but wooden pedestrian boardwalks connecting the houses. Puerto Edén showed us its most beautiful side on one of the few sunny days during the year and was a welcome spot to replenish our supplies of fresh fish and beer. We continued north fighting the steady and strong northern winds heading against us most of the time. We had to hide in Caleta Virgen at the end of the Fallos Channel for almost two days before we could start crossing the open seas of the Golfo de Penas. The Gulf of Distress lived up to its name and welcomed us with up to 40 knots of wind and up to 8-meter waves but under a blue sky. Everyone was relieved when we entered again the quiet channels and reached the Aysén Region with its views of the Northern Patagonian Ice Field. This part of Patagonia is rather well known to us from our numerous trips along the Carretera Austral including a very recent 2-week and 5200-km road trip to the Argentinean and Chilean Patagonia. A last long stretch of day and night sailing including crossing the Golfo de Corcovado and sailing along the eastern cost of the Chiloé Island and through the islands of the Chiloé Archipelago brought us to our final destination Puerto Montt where we arrived safely after 25 days and 1629 nautical miles of travel. Enjoy the pictures and the panoramas and movies from this unique trip.